When winter snows drift across the fruit farms and asparagus fields outside of Mattawan and the region’s fertile soils lie dormant and frozen, Martha Wolgamood is typically busy tending to a crop of young fish that will be planted in Michigan waters come spring. They are the seeds for the state’s multi-billion dollar recreational fishery. Wolgamood manages the Wolf Lake Fish Hatchery, one of six operated by the Michigan Department of Natural Resources (DNR). The facilities provide a crucial boost to recreational fishing in Michigan. More than 19.5 million hatchery fish were stocked at 728 locations on Michigan waters in 2012. The state’s world-class sport fishery provides millions of hours of public recreation annually, in turn energizing the economy. A 2013 American Sportfishing Association Report showed anglers spent nearly 28 million days fishing Michigan waters in 2011. They contributed $4.4 billion to the state’s economy and supported nearly 38,000 jobs. “As long as there is a desire for a recreational fishery there will always be a place for the hatchery,” said Wolgamood, who began working at Wolf Lake in 1987. The pale of winter is often a quiet time at the hatchery, which was built in 1927 and renovated in 1983. Millions of young fish swim in its raceways and tanks. They are monitored regularly to make sure they stay healthy and reach target size. Steelheads remain in the hatchery for a year. They are released to rivers once they grow to six to eight inches long, large enough to survive the downstream journey to Lake Michigan or Lake Huron where they spend most of their life, returning upstream only to spawn. Wolf Lake raises 750,000 steelheads each year to supplement the natural reproduction that occurs on some Michigan rivers. The muscular and beautiful adult fish are prized by anglers who congregate on rivers to fish for them in fall. 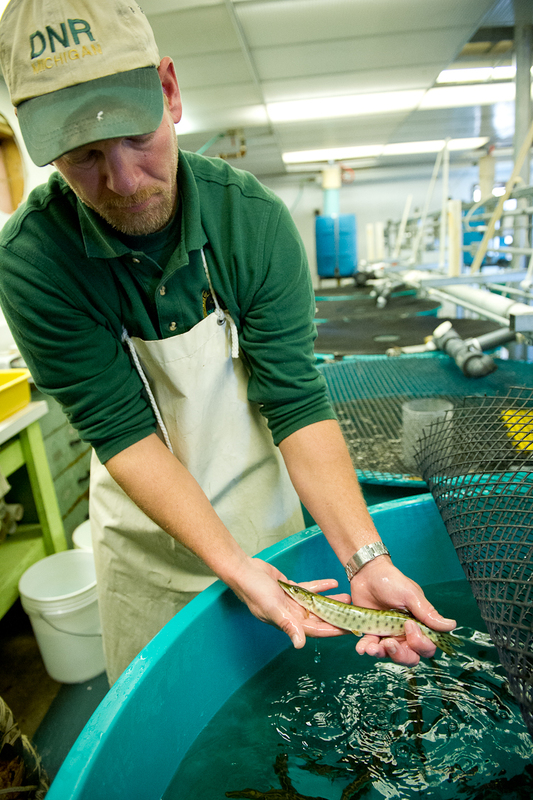 The hatchery also raises Chinook salmon for Lake Michigan. Like steelhead, the Chinooks are the progeny of mature fish that are collected by DNR staffers every year at the agency’s Little Manistee River egg collection weir where the fish arrive when they run upstream to spawn. Roughly 230,000 will be delivered to Lake Michigan waters in spring of 2014. “PIT” tagging future Great Lakes Musky broodstock at Wolf Lake State Fish Hatchery. Photo: Dave Kenyon, MDNR. Wolf Lake also raises 40,000 Great Lakes muskellunge, Michigan’s largest predator fish, prized for its size and legendary strength. Young walleye get their start there too. From s 5 million to 10 million walleye eggs are hatched on the premises. The tiny fish are then trucked to rearing ponds around the state where they continue to grow to finger size before being shipped to inland and Great Lakes waters. Growing fish, of course, requires plenty of clean water and hatchery staffers keep an eye on the water quality. Approximately 4 million gallons of water flow through the Wolf Lake Hatchery each day pumped from wells to the tanks and then on to settling ponds. Phosphorus levels are monitored before the water is discharged into the Paw Paw River. Too much phosphorus can cause harmful algae blooms and other environmental problems. Michigan’s six state fish hatcheries are open to the public for tour. To learn more about their fascinating histories, their hours, and the species they raise check out the list of Fish Production Facilities on the Michigan DNR website. This story appeared in Michigan Blue Magazine. This entry was posted in Uncategorized and tagged Conservation, DNR, Environment, Fish, Fishing, Great Lakes Muskellunge, Michigan Department of Natural Resources, Muskie, Salmon, Steelhead, Walleye, Wolf Lake State Fish Hatchery. Bookmark the permalink. Great article, thanks. I will be re-blogging this. 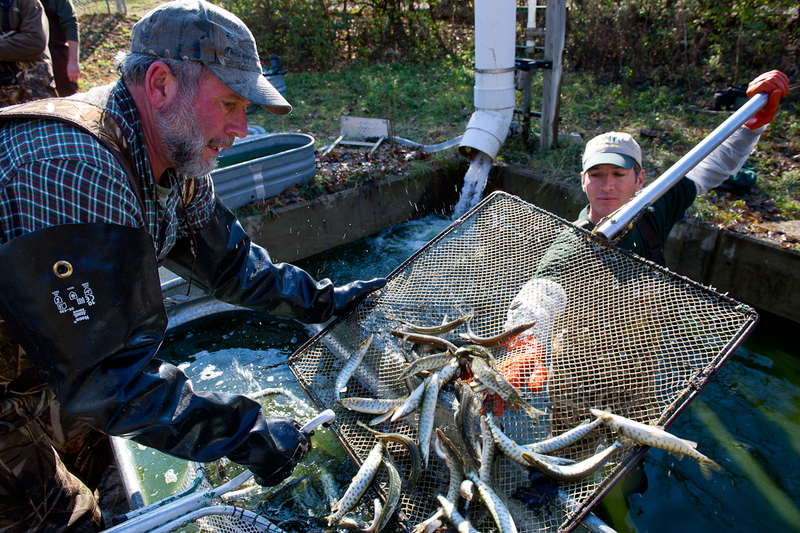 Great informational article about fish hatcheries in Michigan. The Michigan DNR has formed great partnerships with several sport fishing organizations that provide volunteer labor, funding, and research to assist the DNR. All of these clubs have their specialties such as the Michigan Muskie Alliance, walleye associations, and steelhead and salmon clubs. The volunteers are proud to do what ever they can. The fish culture projects are also great learning experiences for the youth which will be the fishery stewards of the future.